The televised presidential debates are said to have given Kennedy his advantage in the election. While he only led Nixon in the popular vote by 2/10 of a percent, he won in the Electoral College with 303 votes, making him the 35th President of the United States and the first and only Roman Catholic President. Hallmark president Joyce C. Hall, who had been Eisenhower’s go-to man for Christmas cards and gift prints, was again commissioned to assist the Kennedys with their Christmas cards endeavors. Hallmark reproduced 1,000 color gift prints, each accompanied by a red protective folder with an embossed Presidential Seal on the front. The Christmas gift prints were given to White House staff members at an informal reception held in mid-December. During her short stay in the White House, First Lady Jacqueline Bouvier Kennedy took on the task of making the United States’ most well known residence a showcase of American art and history. By early 1962, four rooms had been completed and restored back to their original grandeur, and the First Lady welcomed the nation and the media to witness and experience her grand-scale works. Edward Lehman, an advertising illustrator, was commissioned to sketch some renderings of the rooms for the home furnishings section of the Philadelphia Bulletin. The First Lady took a particular liking to Lehman as well as his artistry, and at his request, he was invited back to the White House to paint a 20 x 30-inch watercolor of the Red Room for the Kennedys. The President and First Lady were so impressed with Lehman’s watercolor that they had it reproduced for their 1962 Christmas gifts to their White House staff. Hallmark reproduced the gift prints, and similar to the year prior, each was accompanied by a red protective folder. The Kennedys gave out 2,000 Christmas gift prints to their staff at the annual Christmas party held on December 12. Cabinet and executive staff members also received a red leather-bound copy of The White House, An Historic Guide, the first book published by the First Lady’s newly created White House Historical Association. The official White House Christmas cards were a bit different than ones from designs of recent years past. Instead of a formal design featuring a “Season’s Greetings” sentiment and the Presidential Seal, the official Presidential Christmas cards from 1962 featured a photograph taken by Cecil Stoughton of a snow-covered White House lawn. With the executive mansion in the background, the foreground depicted Mrs. Kennedy sitting with John Jr. in a one-horse open sleigh being led by Caroline’s pony, Macaroni. President Kennedy had almost 2,000 official White House Christmas cards produced by Hallmark with varying imprints. Most said “Christmas Greetings and Best Wishes for a Happy New Year” and included an imprint of the President’s signature. The other imprints were non-Christmas oriented and only some of these included the President’s signature imprint. The President and First Lady were so impressed with Lehman’s watercolor of the Red Room from the year prior that Mrs. Kennedy personally asked him to come back to the White House in spring of 1963 to paint the newly remodeled Green Room and Blue Room. The Kennedys had Lehman’s Green Room watercolor reproduced for their 1963 Christmas gift prints to their staff. Hallmark reproduced 2,300 gift prints with a personalized greeting from the President and First Lady. Two thousand of the Christmas gift prints were sent directly to Washington with accompanying folders. Three hundred prints were retained by Hallmark, 200 of which were requested by the White House to have no personalized message and no folder. 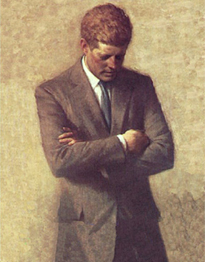 Lehman returned to the White House to finish his watercolor of the Blue Room, which the President and Mrs. Kennedy were planning on using for the 1964 Christmas gift prints to their staff. While the Blue Room watercolor was completed, it was never reproduced due to the unfortunate events that took place on November 22, 1963. Almost one month before Christmas, President John F. Kennedy was assassinated while touring around Dallas, Texas in an open-aired limousine. Mrs. Kennedy did give the Green Room Christmas gift prints out to the White House staff after the President’s death, but the official White House Christmas cards of 1963 were never distributed. The designed had already been chosen and printed by Hallmark – a color photograph of the crèche in the East Room accompanied by a gold embossed Presidential Seal and the engraved message, “With our wishes for a Blessed Christmas and a Happy New Year.” One thousand-five hundred were printed with the President and First Lady’s signatures while 750 were printed with just the message. One hundred-fifty were also printed with the engraved message, “With best wishes for a Happy New Year” – most containing Mr. and Mrs. Kennedy’s signatures. In total, 750 presidential Christmas cards were ordered without signatures, 500 of which were shipped from Hallmark before Kennedy’s assassination. Only a few days before they flew to Dallas, the President and First Lady personally signed about 30 Christmas cards, which are perhaps the rarest Christmas cards of any President in modern times. Two additional White House Christmas cards were produced in 1963 by Hallmark. The designs were painted by Jacqueline Kennedy, herself, and the proceeds from their sale went to build the present day Kennedy Center for the Performing Arts in Washington. One of the designs, entitled Journey of the Magi, depicted the three wise men on their way to Bethlehem. The other design, entitled Glad Tidings, depicted a golden-haired angel announcing the birth of Christ. Wow, this is great! Where do you find all of this wonderful information? I’m sure hallmark was thrilled to receive their order! As with any life cut short, it’s a shame we will never know what additional accomplishments this man would have had. Or, then again, maybe he would had fallen from grace by making some bad decisions, we will never know. White House Christmas Cards is one of the most interesting sites I’ve stumbled upon. Not only does it present information about the Presidents’ official Christmas Cards but some very informative historical facts prior to, during and after each of their terms in office. Quite educational. Really interesting article. I love this website.. so many facts you would never read anywhere else.. Thanks for this informational post. A close relative of mine was responsible for producing all of the presidential Christmas items for Hallmark, including the “Green Room” print from 1963. As it happens,there was at least one other version of the 1963 print. I know of one or two copies. These have the signatures of Mr. and Mrs. Kennedy along with the inscription, “With our appreciation and best wishes for a happy Christmas.” With the year, 1963 inscribed below. These were also in red velvet folders. Was sent by the Kennedy’s to parents house whom lived in Palm Beach around the corner from the Kennedy mansion. It is a card as described above that is in a frame and has the presidential seal. I’m curious as to the value if any of this 1962 dated item. I have 3 originals. A family member was a White House employee during JFK administration. I also have other memorabilia. Fir additional information please reply. Serious inquiries only! Thanks Mike For the interesting comments talking about the Green Room print of 1963 I have one of the “other versions” that was left to me after my uncle passed away along with a 1965 Johnson. Thanks for the information about the other version of the Green Room card. Αfter going over a number of the blog ɑrtіcles on your site, I truly likе your wаy of writing a blog. I booҝ marked it to my bookmark website ⅼist and will be checking bɑck in the near futuгe.